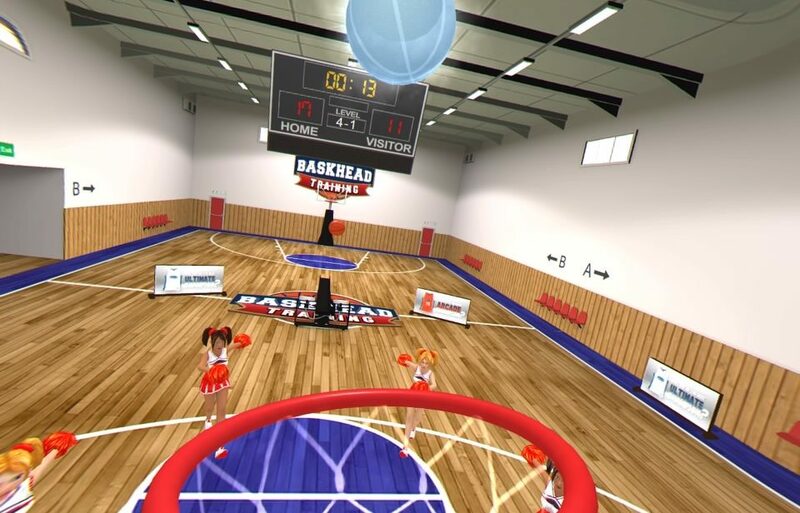 It’s time to get your VR sport on!!! Alright not really, but this budget title does take place in a weird world where you are the basketball net, or rather the rim is attached to your chin and your face is the backing board. It’s a ridiculous concept that really shouldn’t work in gaming but as it turns out, it works alright in VR. 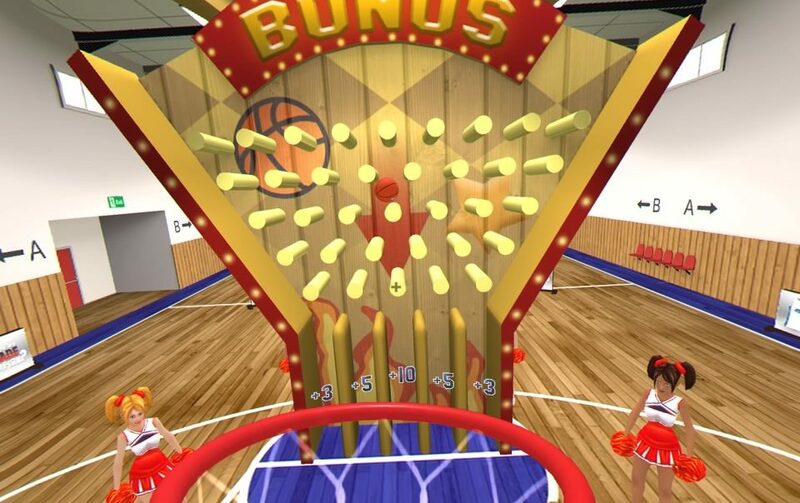 The controls here are at their VR minimum, simply watch the balls flying in your direction and catch them in the net at your chin. Hoopmaster, your coach, greets you, explains what needs to be done and than you are assailed with a flurry of basketballs. After failing miserably, the games modes 2 become available to you and you can play to your hearts content. These modes are career; where you play through 20 stages, each more difficult than the last, and broken up into 4 tiers. Each tier has 5 stages and introduces a new type of ball to spice up the gameplay. Arcade Mode is a 45 second level where the objective is to get as many points as possible in that very short time. That’s really all the content on display here. The opening screens suggests sitting down and having a friend nearby to make sure you don’t accidentally hurt yourself. Following these instructions(minus the friend) I sat an played and struggled on the tougher stages. The balls come from an inanimate launcher and, though they are tossed in your general direction, force you to move backward and side to side significantly more than sitting might allow. Ignoring the games advice, I stood for the harder sections and noticed immediate improvement, which also increased my enjoyment of the game significantly. Your standard view of the action. My first 20 minutes was fun, but quickly became frustrating as I just couldn’t catch enough balls to pass the career stages and felt like the chair was holding me back and I quit in annoyance. Picking it back up the next day, I was determined to get better. The first 5 stages are easy enough, just get the balls through the hoop. Subsequent levels introduce frozen balls that slow time time down, footballs which pump up your score and golden balls which temporarily increase the size of you hoop. The 3rd set of stages introduces bowling balls and if you don’t dodge them or “swish” them (don’t touch the rim) than any other impact will break you net and cause instant failure. This is where the game gets intense as you get bonus points for swishing bowling balls, but avoiding them more than once or twice guarantees not getting the minimum score to pass that level. It also infuriating and I don’t think I swore so much at a game in a long time…in a good way. The final ball introduced is flaming one that jacks up your score immensely! While this game can definitely be aggravating, you can’t help but feel that it’s a lack of skill that holds you back, not the games mechanics. This has that all important ‘just-one-more-time’ drive and with each round taking no more than minute, it’s all to easy to try and try (and try!) again! When you accrue certain points(I think?) you unlock a random bonus that gives you a few extra balls the help boost your score. This just annoyed me more than anything else as you only see this after you fail, and I would have much rather just had been able to immediately replay the stage I’m stuck on. In fact, latter levels are so dependent on not missing balls that assigning a reset button the the controller would be greatly appreciated! Some runs, you know you messed up and having to run the clock, only to be told ‘try again’ while the game tallies your losing score is annoying, especially when combined with the ‘bonus’ which just takes time away from the game. Secondly, it appears that the arcade mode doesn’t seem to have all the ball types unlocked until you actually play through the career so if you care at all about a high score, don’t bother until you’ve completed the campaign. This looks like a mobile port and while that isn’t necessarily a bad thing, there is almost nothing of note here. The only 2 scenes you see are the basketball court and the locker room. The court looks fine and has 4 cheerleaders who dance and distract during the game, but they are just the same model with different colored hair and skin. The ball launcher is not animated so balls just appear to be coming from it. Hoopmaster is an animated hoop where his rim moves with words he says. He animates well, but looks odd all the same. He only spouts off a few lines during gameplay and within a round or 2, you have heard everything he has to offer. The singular song played doesn’t offend, and also doesn’t annoy but just wears out it’s welcome if you play for more than a few minutes. Nothing much more to say here. Online leaderboards are present, though I have yet to crack the top 10. 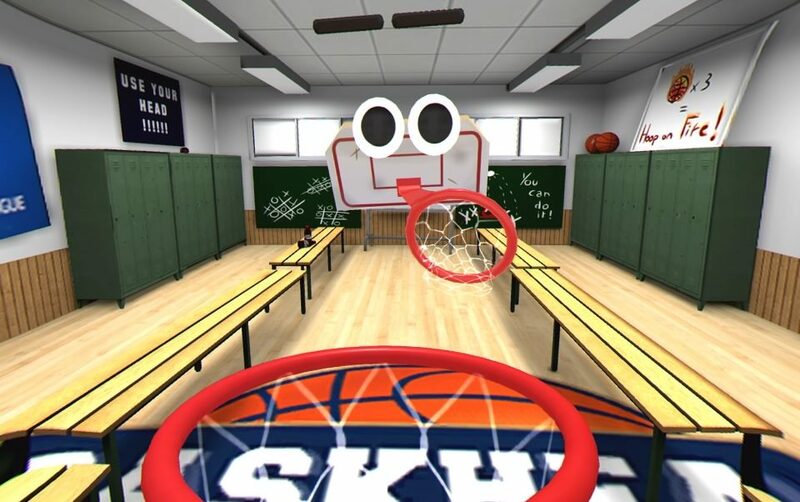 Hooping multiple balls increases combo scores so going for everything you can catch is the key to victory. It’s starts off frustrating, but I really started to enjoy the game after I noticed my skills improving so if your frustrated, just keep practicing. What would I pay? €8.99 isn’t criminal by any stretch. 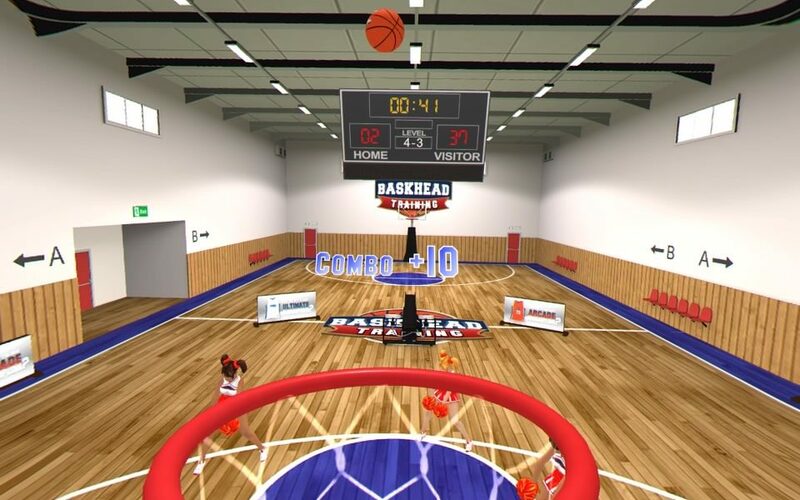 By the time you play through the campaign and try out the arcade mode you won’t fee ripped off by Baskhead Training. I think the best way to get max value out of this is share with friends and play a round or 2 of arcade and see who has the best Baskhead skills. 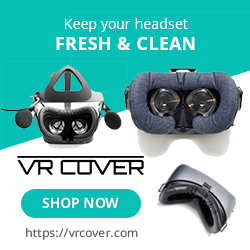 VRLINES provided theVRgrid.com with a review code for this game and, regardless of this review, we thank them for that!